A man comes to in a sea, pounded by raging surf. He tries to stop himself drowning and eventually makes it to shore along with a woman he calls the swimmer. Apart from vague stirrings he cannot remember his previous existence. The world he and she find themselves on is an odd one, mostly sea, with one long line of mountains, the spine, round its equator. There are strange humanoid inhabitants, some with trees growing out of their shoulders, others with faces where their eyes should be, still more use shells as their homes, shifting from one to the next like crabs. There is one break in the spine of this strange world, traversable by a causeway at low tide, guided by the latest in a long line of custodians called Birsay. (At this point I wondered if Robinson has been to Orkney.) In the book this gap in the mountain range is called the brough. Brough actually means island but we can forgive the author this slight misuse. The trip over takes two tides with a dangerous stop in the middle where kelp bladders tied to anchors in the rock allow travellers to avoid being swept away by the currents of the rising tide. Our intrepid travellers of course have to hit it on a bad day. The book is preoccupied with mirrors. One of the things our traveller, who has decided to call himself Thel, is told is that, “Through mirrors we see things right way round at last,” and he muses on the possibility of a landscape in reverse. On helping a group of tree-people escape from the spine kings one of them delays to rescue a mirror. Some time later Thel is pushed through the mirror into an altered spined world before finding his way back. This is not major Robinson. The story is not much more than a novella and each chapter starts on an odd numbered page so there is sometimes a complete blank page between them. 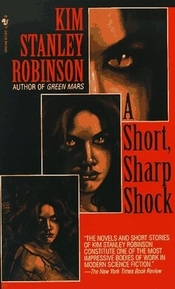 The book is further bulked out by its last 14 pages containing a “preview” of Robinson’s Blue Mars. This is an off-putting practice I hope publishers have now discontinued.